Valentines Days Gift Ideas: "We Were Meant to Be" A Gift For A Wife, Husband, Boyfriend Or Girlfriend. 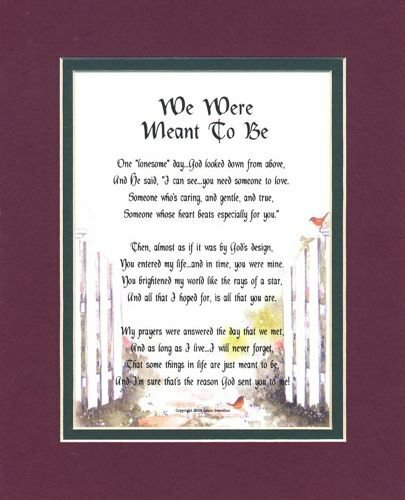 An 8x10 Poem, Double-matted in Burgundy/Dark Green, And Enhanced With Watercolor Graphics. "We Were Meant to Be" A Gift For A Wife, Husband, Boyfriend Or Girlfriend. An 8x10 Poem, Double-matted in Burgundy/Dark Green, And Enhanced With Watercolor Graphics. This beautiful, heart-stirring verse is sure to touch your true love's heart in a profound and meaningful way. It was created by nationally recognized poet, Genie Graveline. This quality product is 8x10 in size. It is double-matted. The verse is .........We Were Meant To Be......One lonesome day...God looked down from above,......And he said, I can see...you need someone to love......Someone who's caring, and gentle, and true......Someone whose heart beats especially for you......Then, almost as if it was by God's design,......You entered my life...and in time, you were mine......You brightened my world like the rays of a star,......And all that I hoped for, is all that you are......My prayers were answered the day that we met,......And as long as I live...I will never forget,......That some things in life are just meant to be,......And Im sure that's the reason God sent you to me!